Do you believe in magic? A famous writer (Isaac Asimov) once said that technology sufficiently ahead of ours would look just like magic. Or maybe it’s just that magic is only a natural force that science hasn’t quite got round to explaining yet. 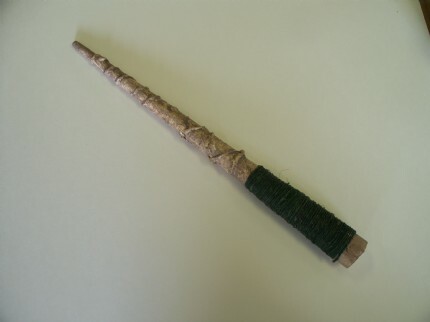 Whatever you think, with this fun project, a little bit of science and sprinkle of your own charm you can make a truly magical wand. 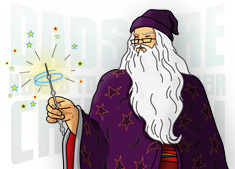 This project will give you the instructions a wand, that with a well practised swish and flick will let you read writing and look at drawings that, before you cast your spell, no muggle or even wizard eye can see.
. . . Once you have made the Magical Wand you’ll be charming, “Lumos” at every opportunity, and successfully telling maps and sheets of seemingly blank paper to “Reveal Their Secrets”, just like Professor Snape in the Prisoner of Azkaban, when he is trying in vain to see what is on Harry’s Marauder’s Map in the middle of the night.
. . . You don’t need to be a wizard to make a truly Magical Wand. All you’ll need is a UV LED at its tip, which can be turned on by a secret switch in the grip area, so that you can “reveal” words and pictures written and drawn with a UV ink security marker. 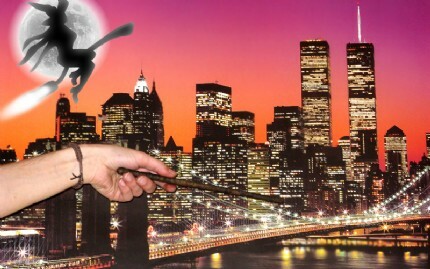 Draw a Marauder’s Map that only you can read with your wand, or write secret messages and spells you don’t want anyone else to read, and then reveal them with your Magical Lumos Wand.
. . . You don’t need a wizards supply shop either. 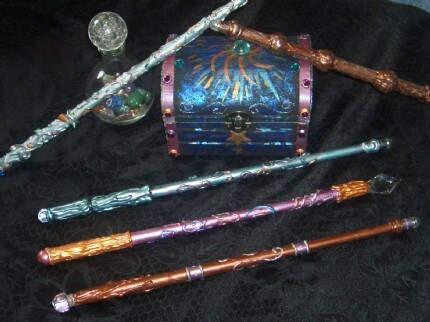 In the muggle world, we have to rely on science to provide our magic, so you will need an Ultra Violet (UV) security marker pen and key-ring LED light kit. You can buy UV marker and LED kits very cheaply from most big department stores or online from a range of different places, but the cheapest I have found is from a fly fishing supplier, which you can see following this link Secret Invisible Ink Pen With Uv Light Keyring .. You’ll also need a small 6 volt battery (ideally 4LR44, or equivalent camera battery). Again Amazon has links to the cheapest GP 4LR44 High Power 6V battery , and you’ll need a couple of short pieces of thin insulated wire.
. . . The project requires a small amount of soldering, so care should be taken as soldering irons get very hot and will cause serious burns if mishandled. However, with the correct amount of supervision, this project is ideal for an electronics beginner as it requires only the most basic knowledge of electronics and only has four solder joints and is the very simplest of circuits. Have a go at making your own switch from two paper-clips; this project explains how. Here you can see the switch hidden by a gilded glue gun blob.
. . . Once you have made the structure of the wand from the instructions on this page, you will need to finish, paint and distress it. 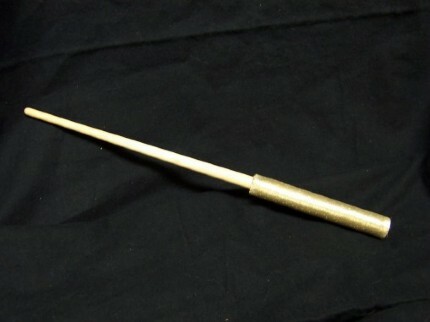 Instructions on how to do this can be found on the instruction sheet for standard Wizard’s Wands, which you might like to try making instead, if you don’t fancy soldering.
. . . 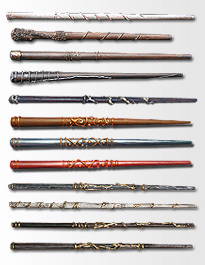 While making your wand, check and re-check the function of the solder joins at every step by touching them together or to the battery to light the LED. 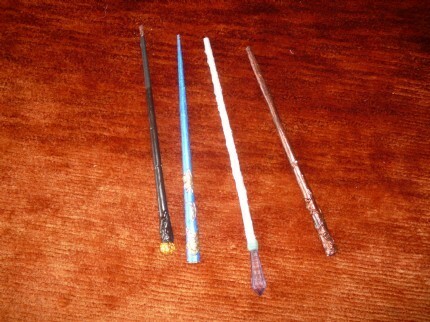 It would be a pity to finish your wand and find that it did not work because at some point in the making process one of the wires’ solder joints broke. The download comes in both US Letter size and A4 and includes all the instructions you’ll need to make a Magical Lumos Wand. 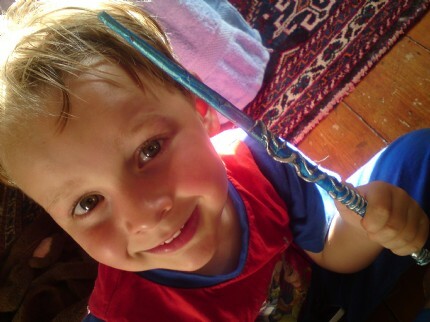 Posted by nadir187 - This is my lad with his recently created wand - getting very good at "Expeliarmus" !! 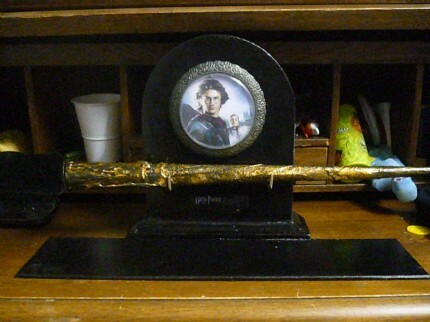 Posted by luppie05 - made a wand holder from an old clock! The box is still to come. Posted by yoyomax12 - I had never soldered before, but it was very easy to do! 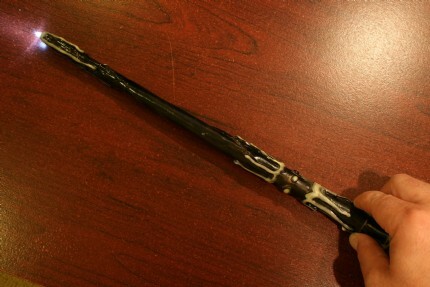 This turned out very well and the wand is bright enough to use as a flashlight! 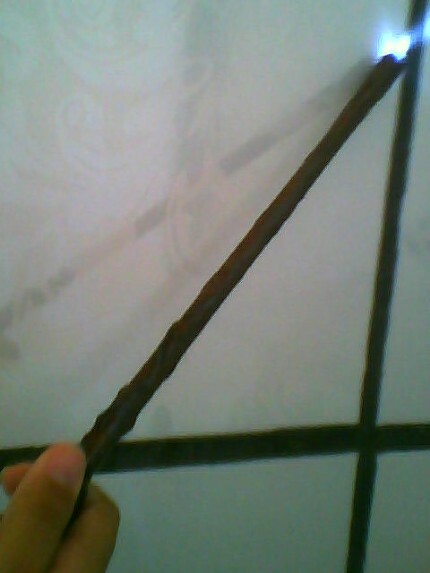 Posted by tristanzdad - This is my son's first wand. We used phosphorescent paint for the design so it glows in the dark (the more coats you use, the better it glows). 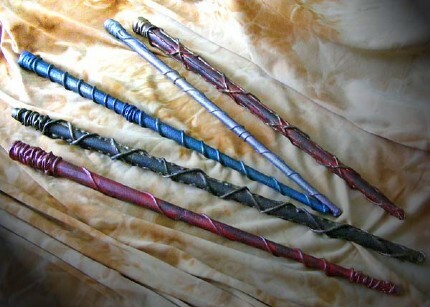 He plays with this more than his store-bought Harry Potter wand. 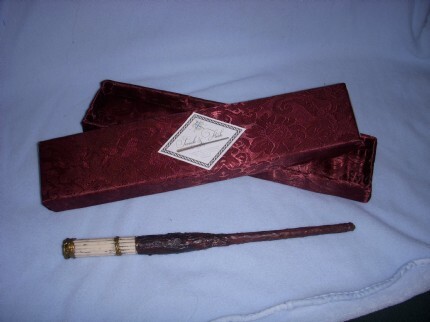 Posted by guihcosta - My Lumos Wand ! 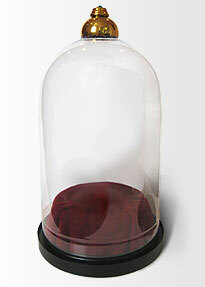 Posted by bjohnson - Love this project! 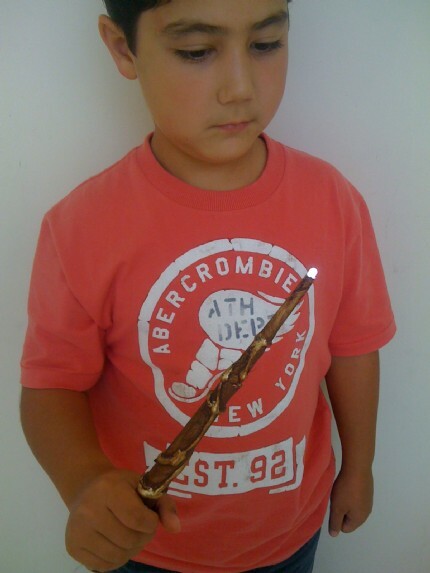 I teach a Harry Potter summer camp and the kids loved it, too! 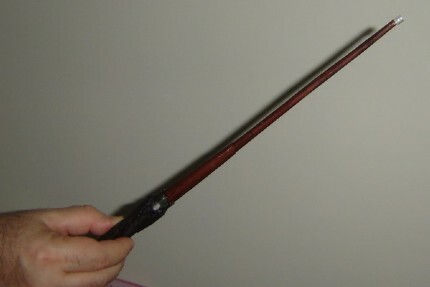 Posted by Nyunyu - I had some problems to do, I used a little more technical tricks to make my wand of light, but the instructions helped me a lot, thanks to all! 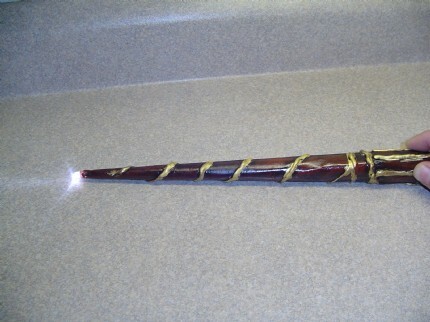 Posted by jolovesvlad - This is the wand I helped my neighbor girl make for her brother as a Christmas present. We used a dollar store book light and a lipstick tube (as the switch) There is also a blue "gem" on the handle. Thank you so much for the idea and inspiration. 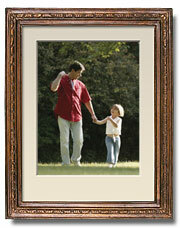 Posted by tinytreasures - We made these with our kiddos. 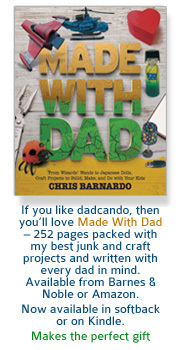 We used femo for some of the shapes and baked them right onto the paper. We also coated them with a epoxy resin for strength and shine. 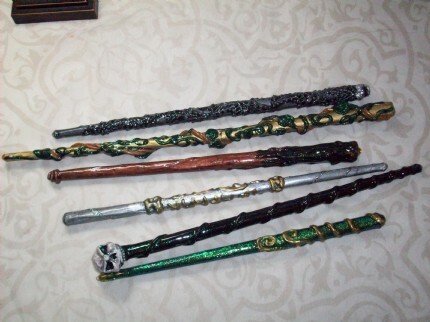 Posted by Madinah - These r my favorite wands. The handle of the light blue one also detatches to reveal a pen.